Dr. Tom Clemens, President of the Mt. 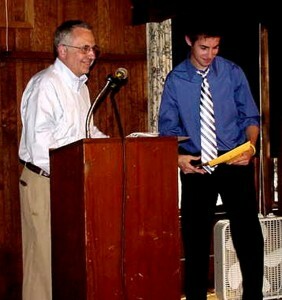 Gretna Arts Council announced the awardees of the 2011 Scholarship program. Benjamin Simpkins attending Vassar, Martin Groff attending Lebanon Valley College, and Ryan Brunkhurst attending Indiana University in Bloomington were selected through a competitive process to receive the scholarships for the 2011-2012 school year. Dr, Clemens stated that this year we have a great many excellent candidates and we congratulate these three young people for their achievements and wish them the best as they embark on the next phase of their career. Since our program started we are delighted to have been able to award approx $15,000 in scholarships to students of the Lebanon Valley. Applications for the 2012 Program are available here and can be submitted via email to MtGretnaLibrary@aol.com after November 1, 2011. Please email all questions concerning scholarships to MtgretnaLibrary@aol.com. Dr. Tom Clemens, President of the Mt Gretna Arts Council, announced an expansion of the Arts Council Scholarship program with the addition of a $1000 Dale Grundon Memorial Scholarship for Photography. Dr. Clemens stated “Dale was a valued member of the council for decades most recently serving as Vice President. His twin loves of Mt Gretna and photography allowed him to document many events which he shared with the community. We will miss his presence in the community. The new scholarship is a fitting tribute to a valued colleague.” The scholarship is open to students accepted or attending a post secondary educational institution with a major in photography. Applications for the 2012 Dale Grundon Memorial Scholarship for Photography are available here and can be submitted to MtgretnaLibrary@aol.com after November 1, 2011. Please email all questions concerning scholarships to MtgretnaLibrary@aol.com.